Continuing on my Christmas card creation marathon, I next pulled out scrapbook papers with themed elements that could be used as card fronts with minimal embellishment. Rubons and stickers were used for the sentiments. I did four out of a single 12 x 12 page cut into sections. Love those birch trees. So, that completes 21 cards in one afternoon. Still more to go, but that will be another day. When I was done with those 'window' cards I still had many fronts of cards received in past years. 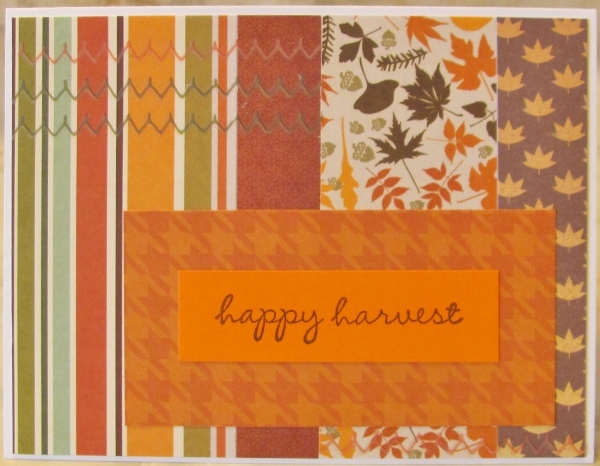 I sorted through to find several that I could trim, mount, decorate and use to make creative scrap recovery cards. Many of these use rub-on sentiments, some have stickers. All have holiday cheer! I suddenly got inspired to start my Christmas cards! The first set I made started with fronts from cards received in previous years. I had seen a window effect over pictures that someone had made using a grid of quilling paper strips. I, on the other hand, made a grid by using a square punch on solid cardstock. These were layered over the top of the pictures. I added stickers with Christmas sentiments and mounted the windows on base cards with backgrounds of coordinating papers. Most of the windows got trimmed with decorative sticker 'valances' for fun. This last one, in a vertical format, got 'snow' in the window created from Liquid Pearls. When I heard of the sudden devastating loss of a friend's husband I wanted to send a sympathy card to her right away. In looking through my supply of cards I found I had none suitable. I started picking up random scraps from the bins on my desktop and thumbed through a couple of pads of printed vellum sentiments. The pieces I settled on were: an embossed black cardstock from which I had sometime punched a heart, a strip of dotted paper, a narrow scrap of grey paper, a lightly patterned paper, a diecut square frame, a vellum sentiment and a torn strip of text-printed tissue paper. I loved how the dotted strip exactly fit into the heart opening. I also love how the tissue text ends with the words 'by heart'. After 49+ years of being together, this sets the perfect tone for what I wanted to express to the widow. When Were You Last Carded? I usually work on Christmas cards throughout the year but I haven't been working a lot on cards for a while now. When I opened my card box I found I had FOUR cards done for Christmas! That will NOT do. I pulled out my 'parts and starts' drawer and found I had three years' worth of card fronts saved from ones we had received from friends and family. I set to work trimming down the artwork I wanted to re-use. Then I went through my bin of Christmas papers and selected one to go with each illustration. Next it was on to choosing a solid bordering paper. I cut all the parts to size and layered them on white base cards. I was working in two basic sizes: 5.5 x 4.25 and 6 x 4.5 (these were the envelope sizes I had on hand). The final step was to pull out the Christmas sticker bag and find appropriate color/style stickers for each card face. I did not do this with those whose artwork already contained a sentiment. My last batch of cards were part of a "10 Free" offer from Shutterfly. I didn't make the cards by hand but the illustration is a photo of a hummingbird painting that I did and uploaded to the site. NOW I'm ready to write our Christmas letter and get to addressing the envelopes. I will probably have leftovers to start the bin for next year. Here we are at the end of the card fronts made from my scrap bin full of strips of design papers. Seven cards have passed by the screen and we have only the brown one left. This time there were fewer strips in the color range and they were a lot longer. This allowed me to use a vertical format for the card. 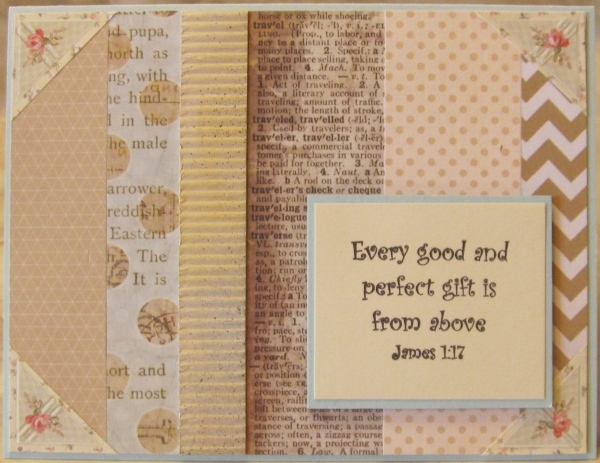 By chance, a scripture printed on vellum fit perfectly as an overlay to the lace paper. I ran it through the Xyron for a full coverage of adhesive, which does not show through the vellum. I had some very fine silver corner stickers which I used sparingly - just on the left side. On the downhill stretch with my little scrap bin full of strips of design papers. I did a little sorting and combining to make card fronts from them. Having seen the pink, orange, red + teal, green, tan + blue, and yellow + gray, we've just got a teal one and a brown one to go. Today we'll look at the teal card. I actually started with a square doily print on tan. I built out from this with two strips of teal on each the left and the right. Then I split a couple of long strip lengthwise and stacked them at the top and bottom. This left one shorter strip which I cut in half to make some crossbars upper left and lower right. I had some colored peel-off border stickers that made a nice framing element on the top and bottom. A pre-stamped sentiment on teal green suited perfectly. Very close to done with the card fronts made with my little scrap bin full of strips of design papers. This blog has displayed ones in pink, orange, red + teal, green, and tan + blue. Just the yellow + gray, teal, and browns are left. The sliced and arranged strips were glued down on card fronts and decorated with text blocks, stickers and rubons. Today we'll look at the yellow and grey card. There isn't a lot of yellow in the mix on this card but I did get some from the floral piece. I added a short strip of yellow crosswise at the botto and bordered a stamped scripture in yellow before popping it up on foam tape. A rummage in the sticker bin revealed the scrolls in colors found in the floral paper. 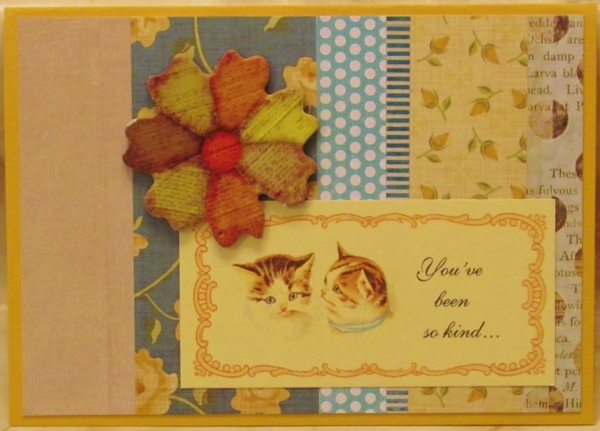 Yay - more card fronts from the scrap bin of strips. We've viewed those in pink, orange, red + teal, and green. There's just the tan + blue, yellow + gray, teal, and browns left. Strips were sorted and glued down on the card fronts and decorated with text blocks, stickers and rubons. Today we'll look at the tan and blue card. I had several tan strips (including one of corrugated card) but only one with some blue in it. I wanted to use it and needed to find ways to bring that blue into the rest of the card. I decided to use a blue card base as a starting point. 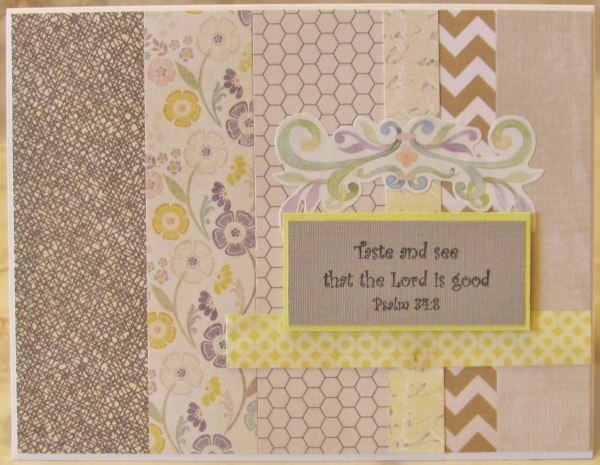 Then I added that same border color to the stamped scripture block which was popped up on foam tape. In my sticker file I found these sweet floral corners - a perfect finish. 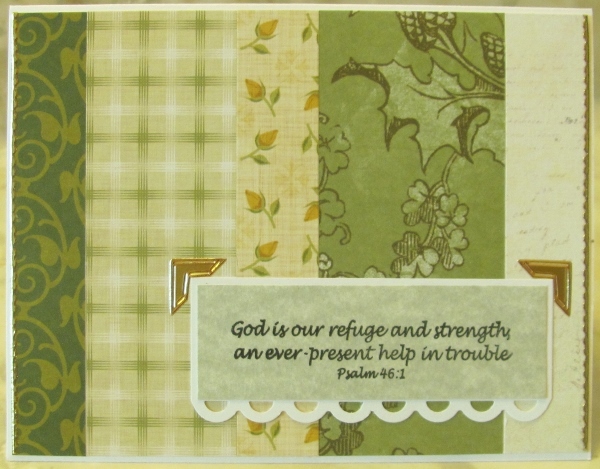 Still churning out card fronts from my scrap bin. I've already shown those made in pink, orange, and red + teal. Today's green will be followed up with tan + blue, yellow + gray, teal, and browns. Strips arranged in an attractive fashion were glued down on the card fronts and decorated with text blocks, stickers and rubons. Today we'll look at the green card. This was pretty straightforward to the point of looking very boring. 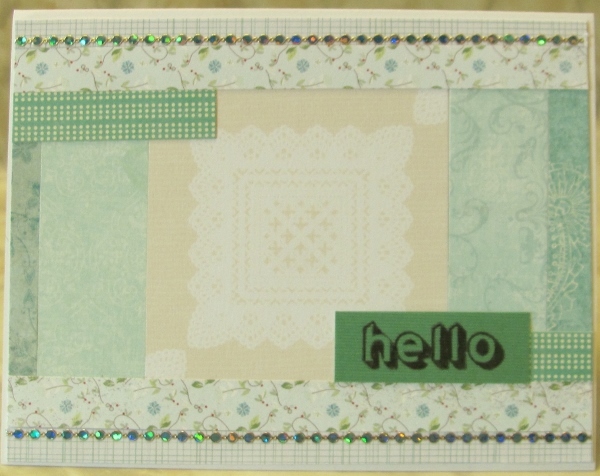 So I added a scalloped border to the bottom of the stamped text block. I selected gold peel-off stickers for corners around the text block and borders up the left and right edges. More sorting and combining to make card fronts with my little scrap bin full of strips of design papers. I ended up making ones in pink, orange (both already shown), red + teal, green, tan + blue, yellow + gray, teal, and browns. The card fronts with the sliced and arranged strips glued down were decorated with text blocks, stickers and rubons. Today we'll look at the red and teal card. The strip that combines both colors was the starting place for the selection of other papers. I had that one tiny strip that wasn't long enough to fit on the card vertically so I swung it around to the bottom right. This made a great place for a prestamped sentiment, in white to match the base card. Yep, I had even more of the 'stitching' rubons to use. With my little scrap bin full of strips of design papers I did a little sorting and combining to make card fronts. I ended up making ones in pink (shown yesterday), orange, red + teal, green, tan + blue, yellow + gray, teal, and browns. I sliced and arranged the strips in an attractive fashion and them glued down on the card fronts and decorated them with text blocks, stickers and rubons. Today we'll look at the orange card. Two of the papers had leaves printed on them and I kept them together on the arrangement. Then I had one paper that was a rectangle instead of a strip so that made a perfect place to drop a pre-stamped - a perfect choice. More of those 'stitching' rubons in the 'perfect colors' make their appearance here. My little scrap bin was full of strips of design papers after recent projects so I decided to do a little sorting and combining to make card fronts. I ended up making ones in pink, orange, red + teal, green, tan + blue, yellow + gray, teal, and browns. After slicing and arranging the strips in an attractive fashion they were glued down on the card front and decorated with text blocks, stickers and rubons. Today we'll look at the pink card. I started arranging the strips vertically to create a horizontal card and then saw that one of them had text running lengthwise so I placed it at the top. 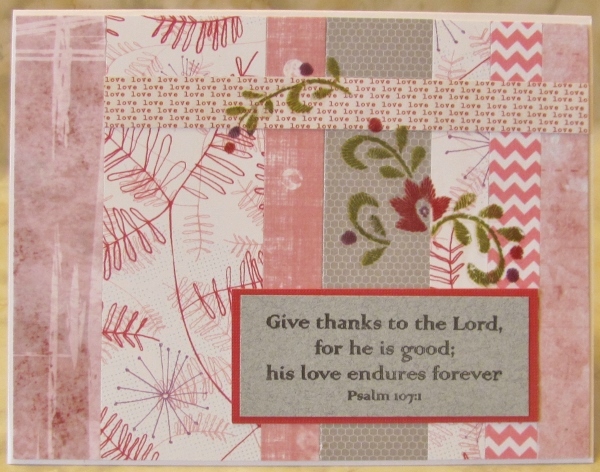 I bordered a pre-stamped scripture with some raspberry cardstock to go with the sketchy ferns in the largest paper. When I went looking for border stickers I came across some forgotten 'stitching' rubons. These flower sprigs were the perfect color and came out looking great. It is fun to gather these groups of strips out of the scrap bin and immediately flash on a project originally made with some of those papers. This set of papers did NOT make me feel that way. I certainly remember seeing them in the paper bins but I really don't recall how any one of them made it to the scrap bin. Obviously I used enough of them to end up with a strip but...who knows what it was. All of the strips have a burgundy element except for the linen look one in the center. I had several matching sheets of sticker that allowed me to come up with four of the berry clusters. These were arranged in alternating facings up the wide linen strip. A burgundy base card was used with a border exposed. For a sentiment I mounted a gold peel-off sticker on burgundy and tucked one end under a berry. The inspiration for this scrap grouping was the two outer pieces featuring graphical black, white, grey and a hint of yellow. The pieces I chose to go with them are all shades of grey and focus on textures. By putting the two lighter pieces at the ends I created a frame for the block of greys. 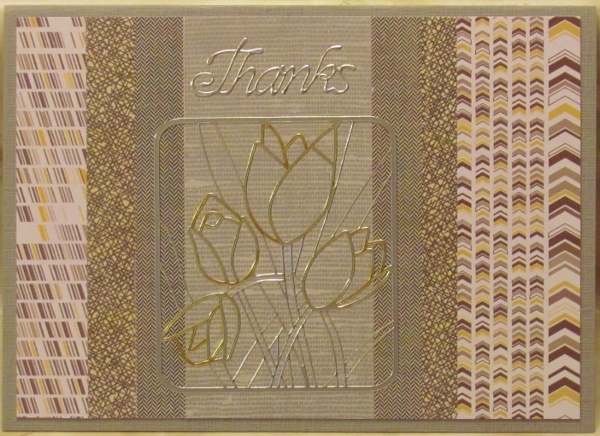 In decorating this background I chose a silver peel-off picture of tulips. I used alcohol marker in yellow to color only the lines forming the flowers. The base card is also grey so it really fades into the background. I used a silver peel-off sticker for the sentiment. This scrappy background is all about the relative values in the cream to brown strips. I arranged them alternating in lights and darks without any idea what would eventually decorate them. 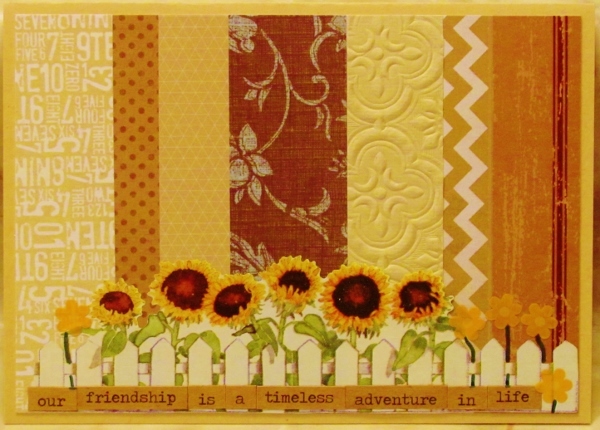 A search through my sticker bin yielded this picket fence framing a line of golden sunflowers. And I added some golden daisies on each end. I think the brown and blue floral paper in the center is representing the sky. For text I created a phrase out of kraft word stickers from a Tim Holrz line. 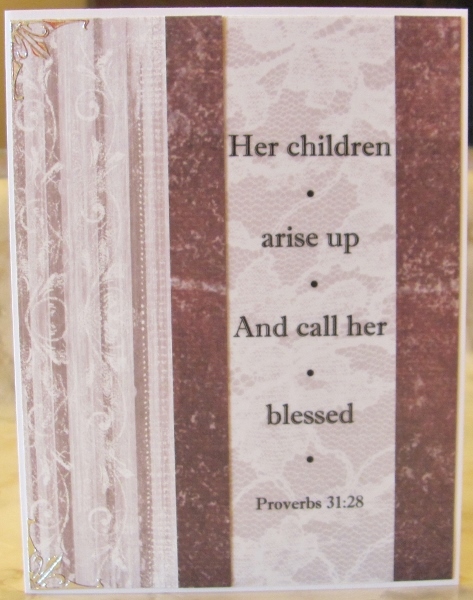 The feature scrap strip on this piece is a golden brown with banners of white doilies. None of the other strips in the scrap bin really matched it so I just went with darker browns and told myself I was working with milk chocolate and dark chocolate. That led me to add a rose sticker that incorporates some script and whose color blends well with the milk chocolate. That rose brought me to color some white peel-off sticker borders with three colors of red alcohol markers to get the same range of light and dark. 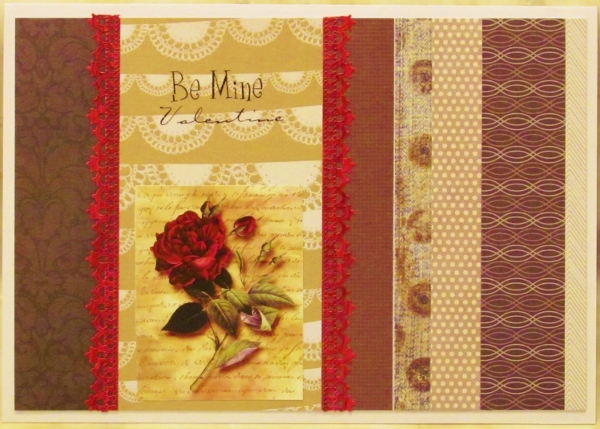 Once these elements were added (chocolate, roses, lace) what else could the sentiment be but a Valentine quote? This is a combnination of two rub-ons. I gave this a white base card to refer back to the white doily section. 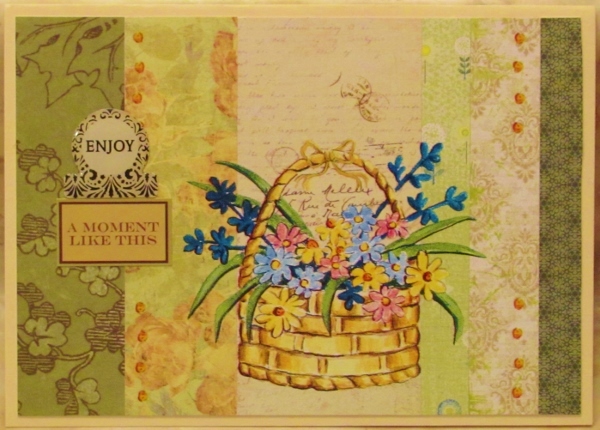 Oh I love all the spring-y greens that came together for this scrap background! I placed the darker ones on the outer edges to create a frame effect. The spring ones frame out the focal piece which includes some unreadable script. I found a rub-on basket of flowers and added a bow to the handle from the same sheet. That sheet also had some sets of golden dots and I added those in groups of four just inside the dark green bordering strips. Word stickers from two different sets were combined on the left side. In the scrap bin I found two strips that featured leaves. I juxtaposed one with mixed colors in a random mix of colors and leaf types next to a two-toned rigidly arranged pattern of maple leaves. Complementary colored strips of paper were added to each side to create a more balanced design. I had a fabric tag sticker which I mounted to acinnamon colored cardstock and trimmed to have a thin border. I popped this up on foam tape. A bronze-colored peel-off sticker which includes a couple of maple leaves was laid over one of the dotted strips. 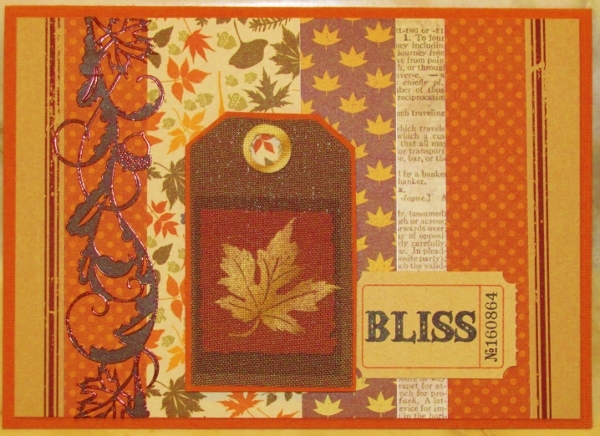 The 'bliss' ticket is from one of Tim Holtz's lines. 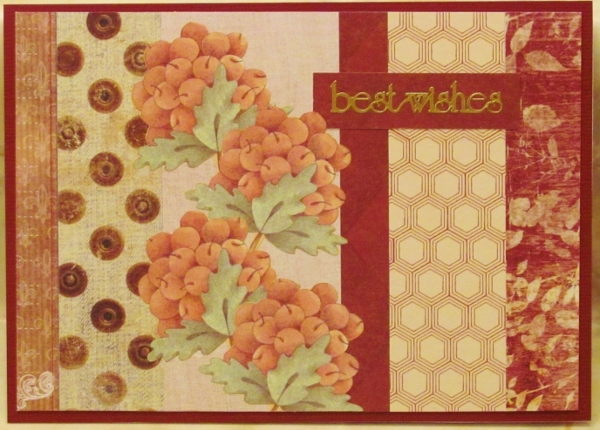 I looked through many of my bins of scrappy stuff searching for elements to decorate this card front. I was rewarded with this chipboard flower which I popped up on foam tape. 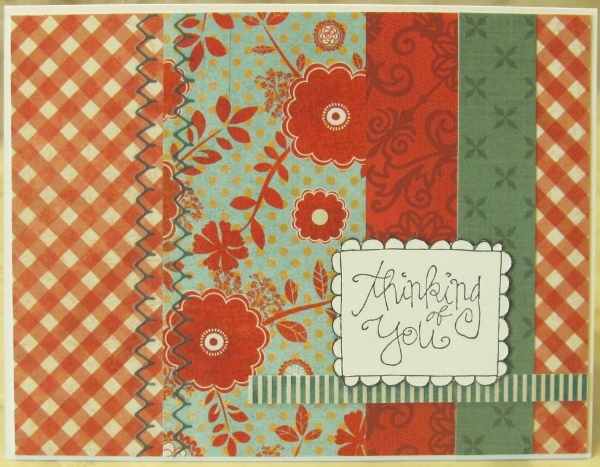 Then, another bin yielded a printed sentiment card which I adhered directly to the surface of the scrappy background. I mounted the background to a golden yellow base card.